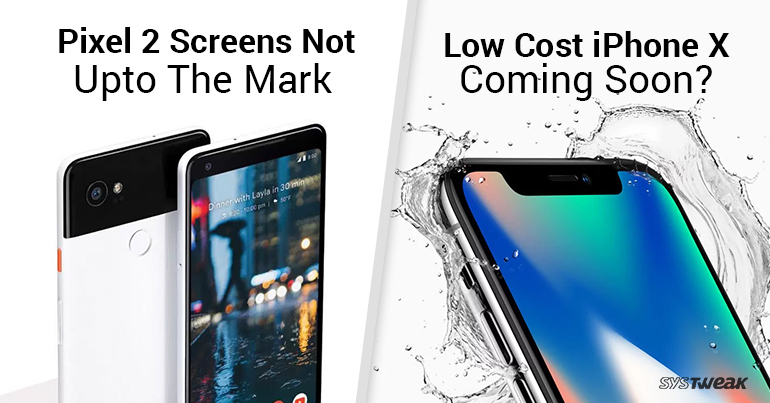 Newsletter: Pixel 2 Screens Not Upto The Mark & Low-cost iPhone X Coming Soon? Early users noticed that there is an OLED screen burn-in issue on Pixel 2 XL and Google is investigated the issue. Although it’s not even a month since Google Pixel 2 came out, one user Alex Dobie from Android Central was the first one to report the screen burn-in issue on Twitter. He reported that the issue surfaced after using the device full time for 7 days. Here in the picture below, if you see the grey background, you will notice fainted outlines at the navigation buttons at the bottom of the screen. Screen burn-in normally appears on a phone when it is used for months or years but showing up within a week of usage is questionable. However, the issue reported can be an image retention rather than screen burn-in. The image retention issue is not permanent but having neither on the phone is a good sign. WHAT DOES GOOGLE HAVE TO SAY? Well, this is not the only issue reported on the new Pixel phones, there are said to be weird tints or discoloration seen when the display is looked from specific angles and also duller display colors have been reported. It would be interesting to know what Google will find out in their investigation and how they will resolve the issue. Apple might launch new iPhone X’s lookalike in 2018 at affordable prices. IS APPLE TRYING TO RECLAIM THE MARKET IN CHINA AND INDIA? When Apple launched iPhone X at USD 999, it broke many hearts of brand loyalists who were love struck with the bezel-less look and Face unlock feature of iPhone X. Apparently, according to speculations, Apple is trying to mend the broken hearts by launching cheaper look-alike of iPhone X in 2017. With the launch of iPhone 8 and 8 Plus, the Apple market has fallen 3% due to its low demand. Due to all this, it is a wise decision to give a thought on launching cheaper models. The reports suggest that soon China would have affordable iPhone X like models while others have to wait. WILL THIS AFFECT IPHONE X’S PREMIUMNESS? iPhone X is a premium range phone and though every iPhone lover would want one not everyone can afford a hole in their pocket. iPhone X is said to be the predecessor to the future bezel-less iPhone and has set a trend to get better. The premiumness would not be affected indeed but with the launch of an affordable iPhone, it would be a win-win situation as along with the premium customers, the niche market would also be conquered. DID APPLE TOTALLY FAIL WHEN PRICING IPHONE X? It seems that Apple has not thought it through and put a high price on the anniversary edition disappointing some of the users. However, Apple has now been trying to cope with it before the plan backfires by thinking to launch iPhone X look alike in many affordable prices in 2018. Further, it is claimed that there would be a product mix led by two iPhones with OLED displays and one with somewhat economical LCD in the iPhone X’s extended aspect ratio.